Now, back from the Florida excursion, it’s time to grade ourselves on how we did. Early bailout: A. Exactly the right decision. As noted before, it is tremendously liberating to be free to make the right call at any given moment, free from constraints imposed by external considerations. 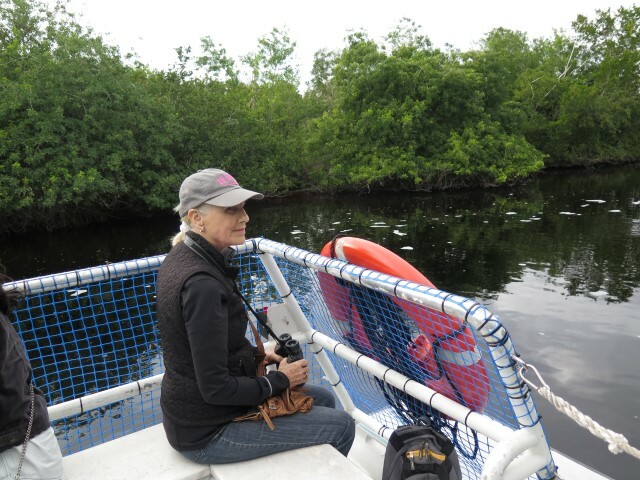 By the time we got home, Wendy’s foot plainly called for attention and had we been sitting around at Chokoloskee Island, basically crippled at the campground with little to do but stare at the mangroves, we would have been scolding ourselves for not being smarter and heading home. Trip Planning: B. Each stop in our itinerary presents several factors for evaluation: the locale of the stop (what is there to do in the area? ), the campground itself, and the duration of the stop. Evaluating the stop, though, isn’t as simple as a weighted average of the scores for those three factors. 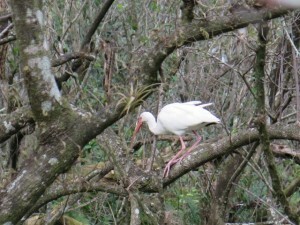 During our trip, we met, as you would expect, a number of snowbirds. These folks often stayed at a single location for months, maybe as many as six. 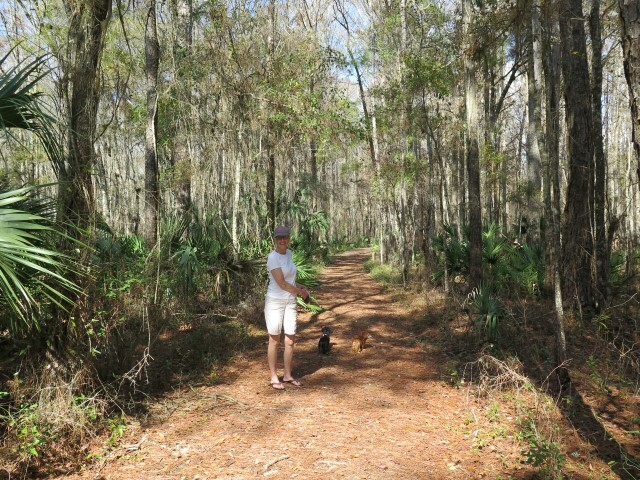 A campground with scores of long-term residents becomes less of a “campground” and more of a retirement community. 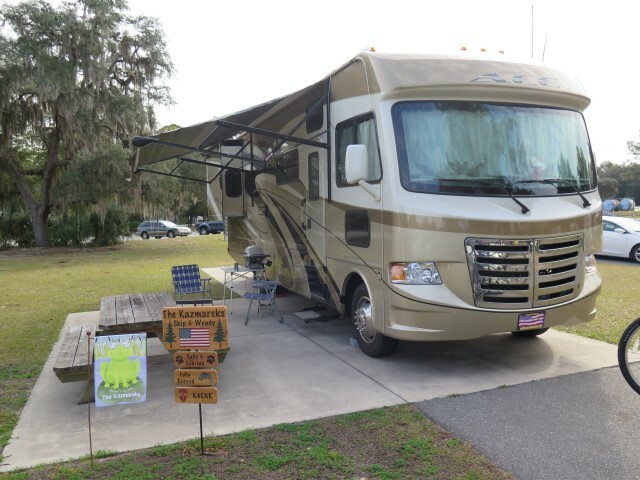 We’ve always thought of ourselves as traveling to see and do things near the campground, not participating in activities in the campground, which means that, for all practical purposes, we’d never want to stay somewhere for more than a week or two. Even in Yellowstone, for goodness sake, one would exhaust the activities in a matter of a few weeks, not months. And we’ve never seen ourselves as going someplace in order to play shuffleboard, pickleball, golf, bingo, or Texas Hold’Em. That, in turn, means that heading south for the winter means we either need to keep moving every week or two (and rarely repeating the stops from one year to the next) or we need to change our expectations and spend time enjoying living in an annual retirement community that blooms for a while and then disappears. Or maybe that’s not the right way to think about it. In brick and mortar homes, we all have things we enjoy doing. Many RVers just continue doing those same things on the road. We met guys who play golf and go fishing while they travel, just as they would at home. I met a guy who brings his radio-controlled model aircraft with him. 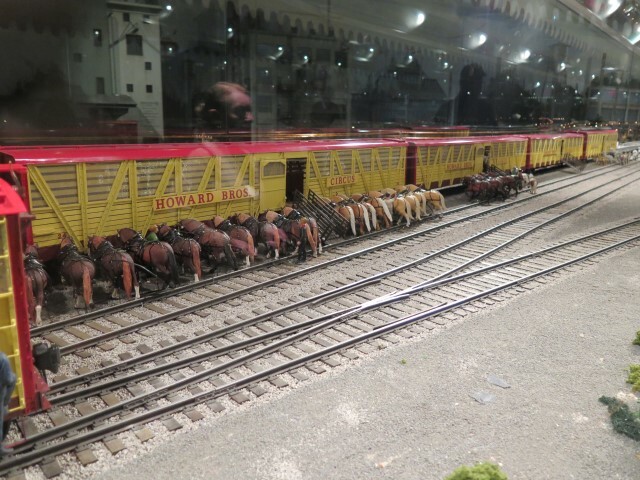 I’ve even heard of a guy who brings his model railroad setup with him. So, as to this trip, which was it? A number of quick stops in succession, seeing the local sites, or longer stays, relaxing, staying warm, and doing what we like doing while there? The plan didn’t actually do either as well as I would have liked. 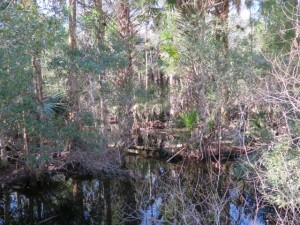 At several stops (Cedar Key and the Everglades, for example), we didn’t schedule enough time for local sights. 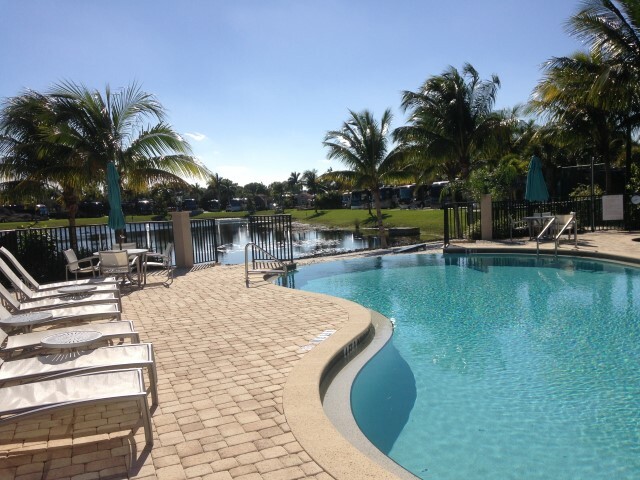 At Naples, I didn’t schedule enough time for internal activities. 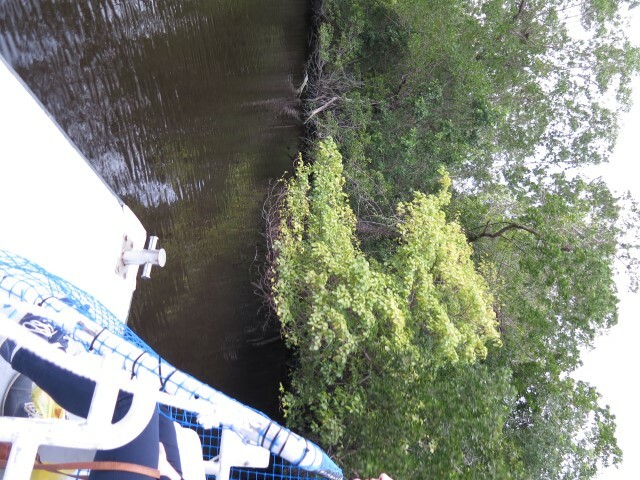 And at others (the would-be stop at Chokoloskee Island, for example), I can’t figure out what I was thinking when I booked the stop for as long as I did. We’re planning next year’s trip, and we’re still gravitating towards the series-of-stops concept, but the jury is out. We may want to try a longer-term stop at an activity-intensive campground, just to see if it fits us. Living in a Confined Space: A. When we tell people we spent a month in a 10’x20′ box, we are often asked how it is that we didn’t kill each other. Maybe it’s just us, or maybe Wendy harbors some secret plan that will someday put an end to these postings, but we were fine. We never felt cramped, never got on each others’ nerves (much), and never longed for the trip to end. 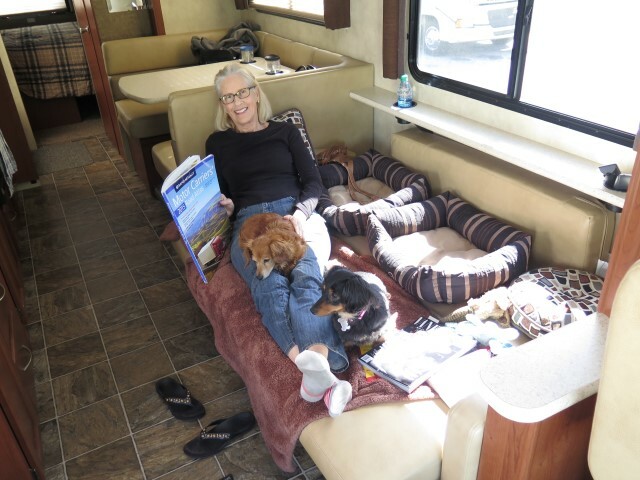 Even in our smallish RV (at least by Class A standards) there seemed to be plenty of room for living. Based on this trip, I think it’s more likely Wendy will kill me at home than in ACE, so I count this aspect of the trip as a lifespan-enhancing success. Overall: A. 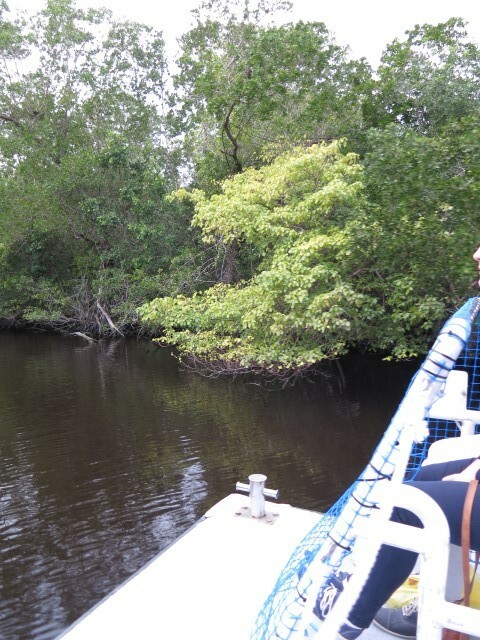 The trip was wonderful. We enjoyed every place we went. Cedar Key was a great first stop, the side trips in Sarasota were fun, the Naples RV resort was luxurious and the Corkscrew Swamp Sanctuary was a special treat, Everglades National Park was everything we hoped it would be, and the last stop at the Miami-Everglades resort gave us a perfect opportunity to pick off a few final checklist items and wind down before returning. The weather was cooler than we hoped for, and indeed was unusually cold, wet, and windy, but it was still way warmer than in Atlanta, so we count that as a success. And the RV people we met along the way were were, as always, friendly and engaging, and at every stop we found something special about the folks we met. It is a testament to how good the trip was that when we returned we immediately started planning our 2-1/2 month trip out west this summer! This entry was posted in Travels on February 29, 2016 by skiprd. Well, it’s not exactly Miami. Miami-Everglades RV Park is just outside the eastern boundary of Everglades, and we thought it would be a suitable location to explore those aspects of the Everglades that we missed while at Flamingo (like the Shark River tram tour), plus Biscayne National Park, plus being a lookie-loo at places like South Beach. And maybe even a day trip down to the Keys somewhere. 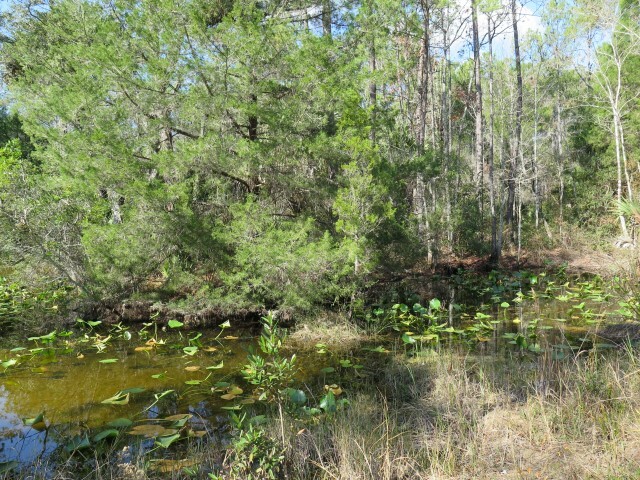 Or, if I got really bold, I was toying with the idea of a ranger-guided “wet walk” through the Cyprus swamp in the Big Cyprus National Preserve (not Wendy’s cup of tea). From here, we’d head to Chokoloskee, then Lake Okeechobee, then The Villages, then home. 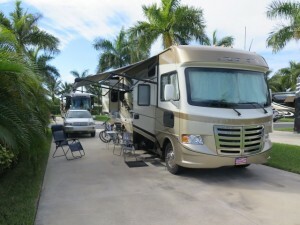 Miami-Everglades RV Park: a little crowded, but basically fine. An OK destination for escaping Atlanta winters and we plan on coming back, maybe even next winter. Great plan. Except that we had to flush it. Here’s the deal. We’re basically old geezers. Proof? We’ve got Social Security, Medicare, and we’ve developed an irresistible urge to play shuffleboard. And one more thing: we now have “afflictions.” You’ve probably noticed that when geezers get together, they engage in a social ritual of sharing stories about their afflictions, using words that have no functional significance for anyone less than 60 years old, words like “sacroiliac,” “presbycusis,” “incontinence,” “prolapse,” “stroke” (not rowing-related), “joint” (not marijuana-related), and so on. It’s great fun, especially when combined with another ritual of showing each other one’s surgical scars and swollen body parts. [On edit: my sister-in-law tells me that in their community, these sessions of sharing afflictions are referred to as “organ recitals.” An apt designation!] So, we thought that talking about afflictions would be a great way to slide into senior living until we realized that talking about our afflictions means having afflictions, which is not fun. So, it’s basically time to bail out. 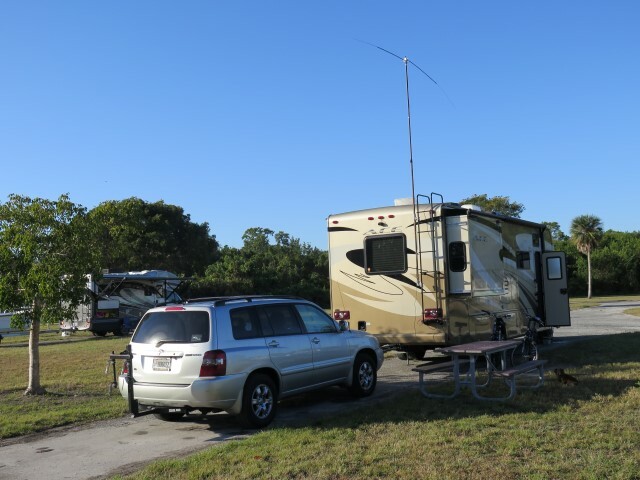 We’ve had a chance to do some things around here, checking off a few stops, like a trip back to the Everglades visitor center, to the Biscayne National Park visitor center (one of the best we’ve ever seen), a drive down to Key Largo, and generally relaxing. We had a great time at a pot luck soup dinner, where Wendy brought her jambalaya, and which was a great hit. We can also check off having a Type 2 Breakdown, as enumerated previously. 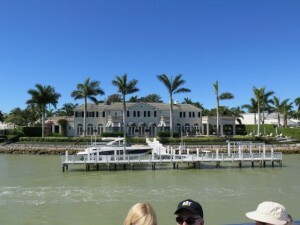 But we’ve done essentially all of the major things we wanted to do on the Florida trip as originally planned, and not hanging around here with a Nagging Affliction makes a lot of sense. Better to disengage than to push a bad position. And here’s the good news: being retired means that there’s no pressure to do something just because it’s on The Schedule. We now control The Schedule, rather than The Schedule controlling us. Of all the aspects of retirement we’ve encountered so far, that has got to be the most liberating! This entry was posted in Travels on February 21, 2016 by skiprd. Forty-four years. 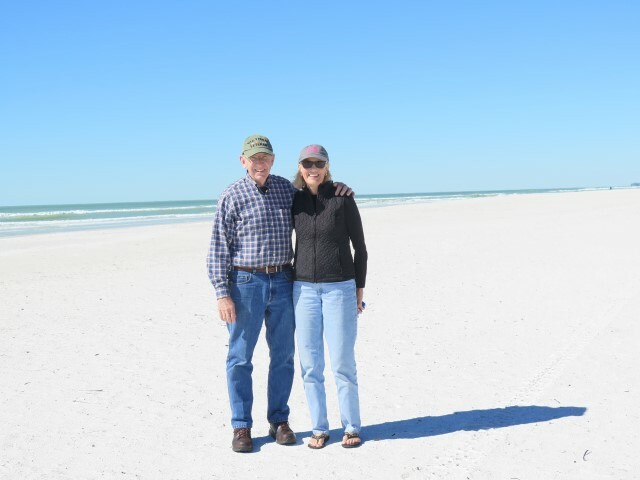 Forty-four years ago, when Wendy and I were traveling around the country, without an agenda, with nothing to do but to enjoy each other and this country, staying in national and state parks as we traveled eastward, we promised each other, “We’ll do this again someday.” And here we are. 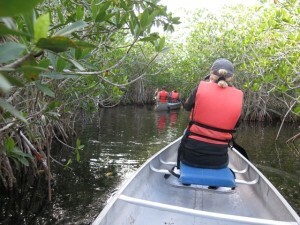 It looks like this will be the year when we see national parks spanning the country from the Everglades to Glacier. And not only are we embarking at long last on fulfilling a decades-old promise, we are doing so in the centennial year of the National Parks system. 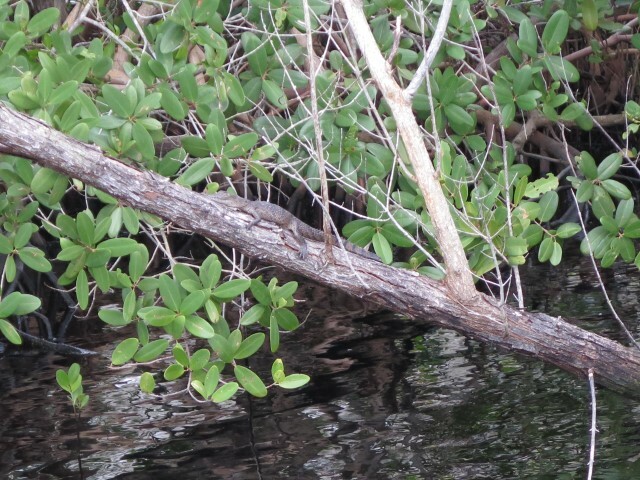 Everglades National Park is a fitting beginning, different from anything we’ve ever done before. 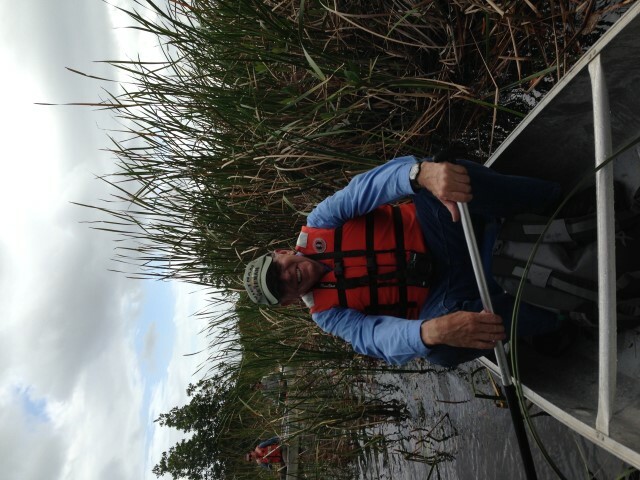 While most national parks were established to preserve some dramatic panorama for future generations of visitors (imagine Teddy Roosevelt seeing Yellowstone for the first time), Everglades was established solely to protect an ecosystem. Over 1.5 million acres of what is essentially a slow-moving river (only 1/4-mile per day), a “river of grass,” as is said, 60 miles wide and only a few inches deep, flowing from Lake Okeechobee southward towards Florida Bay. After a quick stop at the visitor center at the entrance, we drove the 38 miles to the Flamingo campground, visitor center, and marina. And once here, we wasted no time in doing what we like best about such places: visiting the educational displays, attending the ranger talks, and generally exploring what makes each national park worthy of its stature. 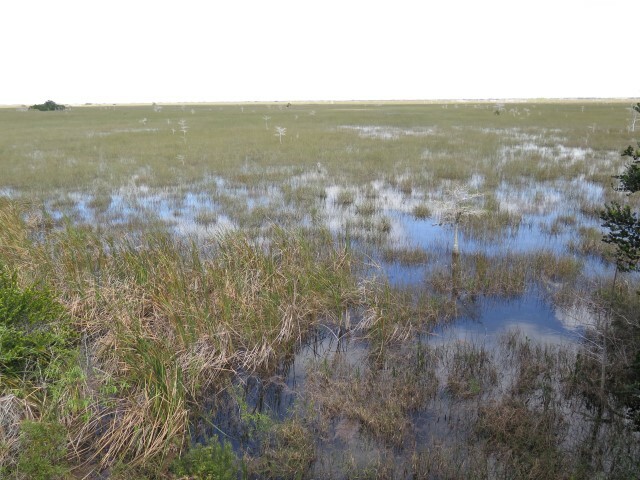 But here, because the Everglades does not exist to preserve things worth seeing, experiencing the Everglades is different than the western parks we’ll visit this summer. Here, the experience is quieter and subtler. It is not less spiritual, but spiritual in a difference sense, not so much standing in awe of the grandeur of creation but more marveling at the intricacy and complexity of the created order in its hidden spaces. 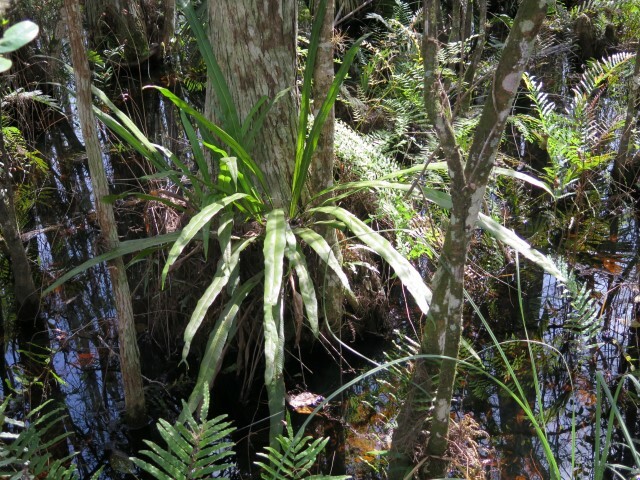 As one of the rangers said, the Everglades “whispers” its message. The “river of grass” at the Snake River slough, “only” 6 miles wide. 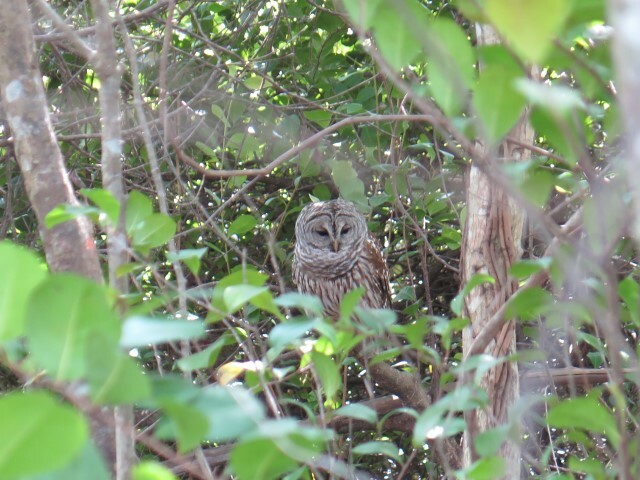 At Snake River slough, a barred owl hooting away back in a thicket. One day we tour a boat tour through the mangroves lining the Buttonwood Canal, through Coot Bay, and into Whitewater Bay. Baby American Crocodile, and no one even noticed his big brother behind him! And we even did a ranger-guided canoe trip on a five-mile canoe trail out and back from Nine-Mile Lake. 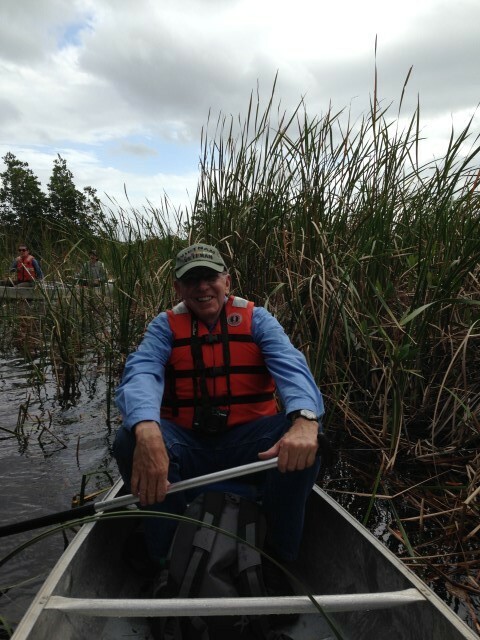 The trip provided a bit of comic relief since, firstly, we are old, feeble geezers who don’t know how to paddle a canoe, and secondly, the wind was howling at 15 miles per hour, gusting to 25, which meant the canoe frequently got caught by the wind and headed sideways into the swamp. Still, it was a great morning. We also “experienced” the Everglades in one of its less appealing aspects: mosquitos. We’re told that this is an “unusual” winter. It may be. This winter has been wetter than usual (normal rainfall in January is 2.5 inches, but this year it was 12.5 inches), and one can imagine that the surplus of standing water has given the little suckers a windfall of breeding sites. Either way, we ventured out only when slathered with DEET and the first few moments inside the camper were always spent trying to clap in mid-air fast enough to squish the little beasts between our palms. We took advantage of one surprising opportunity for a side trip to the old Nike missile base, now a historical site within the Park. For people of my era, the cold war, and in particular the Cuban missile crisis, is not only part of our history, it is part of our being. It’s easy to joke about the backyard bomb shelters and the “duck and cover” drills in elementary school, but I remember, at the height of the Cuban missile crisis, going with my mom to the grocery store, and everything was gone. Everything. I stood there seeing nothing but empty shelves. No milk, no produce, no bread, no canned goods. Nothing. And even as a twelve-year old, I was convinced that war was upon us. Fireballs were going to light up the sky, and for those not immolated by blasts, it was going to be a nasty battle for survival. Memories like that formed us all, and they are part of us even today. 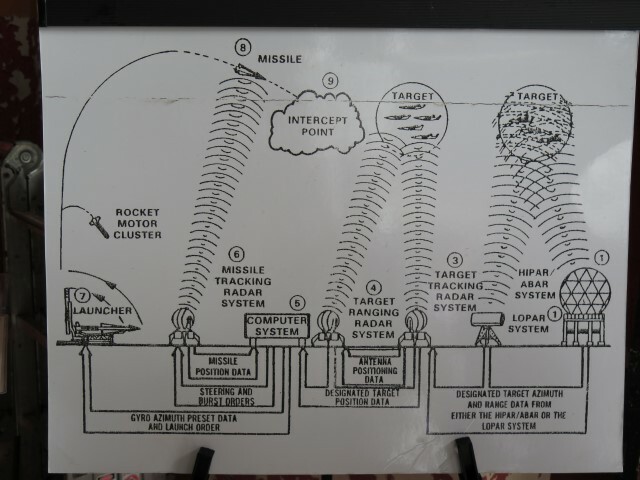 The crisis started in October 1962 when U2 spy planes overflying Cuba saw that the Soviet Union had installed short- and medium-range missile bases in Cuba. A missile launched from Cuba could hit Washington D.C. in 13 minutes. The nuclear warheads for those missiles were on Soviet ships headed for Cuba, and Kennedy imposed a “quarantine” (that is, a blockade) around Cuba and threatened to destroy any Soviet ship that tried to run the blockade. The Soviets said they viewed the blockade as an act of war (it is), that they had every intention of running the blockade, and would use any means necessary, including nuclear weapons, to protect their freedom to navigate the seas. Kennedy then issued his famous threat that any use of nuclear weapons against anywhere in the western hemisphere would be met with an unlimited retaliatory counterstrike on the Soviet Union. The situation was escalating to the point that the very end of civilization was seemingly inevitable. 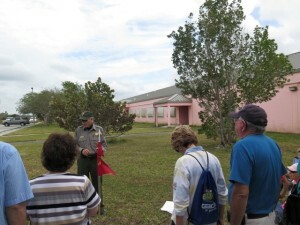 During this time, south Florida was the scene of a military buildup not seen since World War II. Hundreds of military trucks driving down the streets, military bombers landing at every airport available, and trucks and trains carrying missiles arriving every day. Even as the crisis subsided, we all realized that the threat to our very existence could come from as close as sixty miles south. 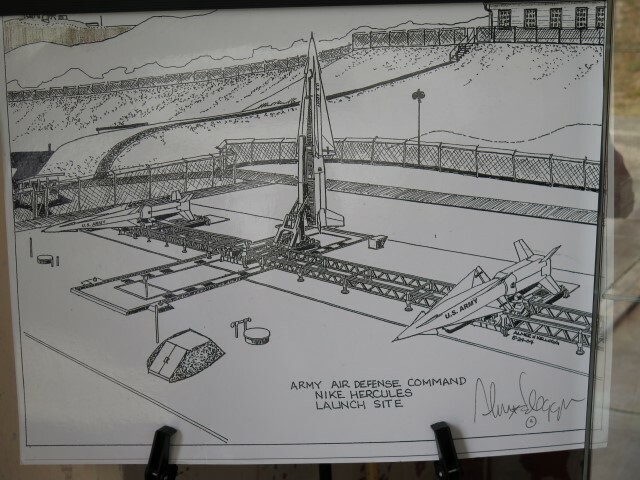 In 1965, the National Park Service gave permission to the Defense Department to build a Nike missile base inside the Park to guard against that threat. 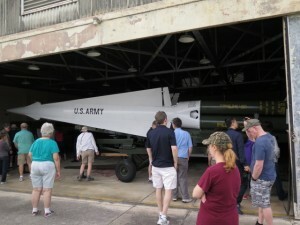 That base survives today as a historical site: Nike Missile Base HM-69. Surprisingly, even though one can hardly imagine an experience less Everglades-ish than immersing oneself in the details of mutually assured nuclear destruction, both of us agree that the tour of the missile base was a highlight of the trip. So, once again, we find ourselves leaving too soon. Too much to do and not enough time. In a sense, that’s the inevitable consequence of racing around Florida, spending only a few days in numerous places, as we scout out possible locations to escape Atlanta winters. But in other places giving short shrift to the locale was tolerable. 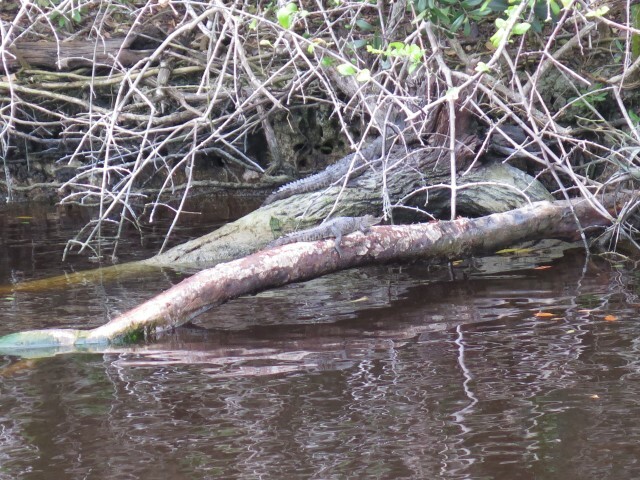 Here, I wish I had made the Everglades a break in the place-to-place dash and booked a stop of at least a week. It deserves it. 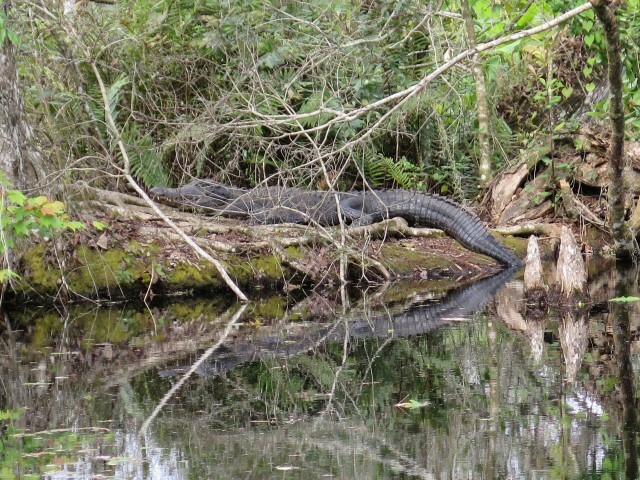 If we can make it back someday (I hope we can), we’ll definitely spend more time here, just listening to Everglades whispers. This entry was posted in Deep Thoughts, Travels on February 17, 2016 by skiprd. A friend suggested that, since I was heading off to Florida, I should read at least one of the books by Carl Hiaasen. I’d never heard of Hiaasen, so I read the reviews and picked Stormy Weather. As I learned, Hiaasen is an op-ed columnist for the Miami Herald with a political philosophy that does not, shall we say, align on very many points with my own. Which means that ordinarily I’d be reading his works only to the extent of my practice of being aware of how the enemy thinks. Except for two things. First, he is a gifted writer and the book Stormy Weather is hilarious. Second, the principal theme that runs throughout his books is particularly relevant to this trip: through the irresistible influence of developers, tourists, and corrupt politicians, Florida has been destroyed by some weird combination of vulgarity, venality, greed, and lunacy. Old town Naples, particularly the Fifth Avenue area, once one fights the traffic to get there, is chock-full of trendy restaurants and up-scale boutiques, neither of which is our style. But then, there’s “real Naples.” “Real” in the sense of “unreal.” As of June 2015, Naples has the highest per capita income of any city in America. Two-thirds of all American billionaires (“billionaires,” with a “b”) live in Naples. 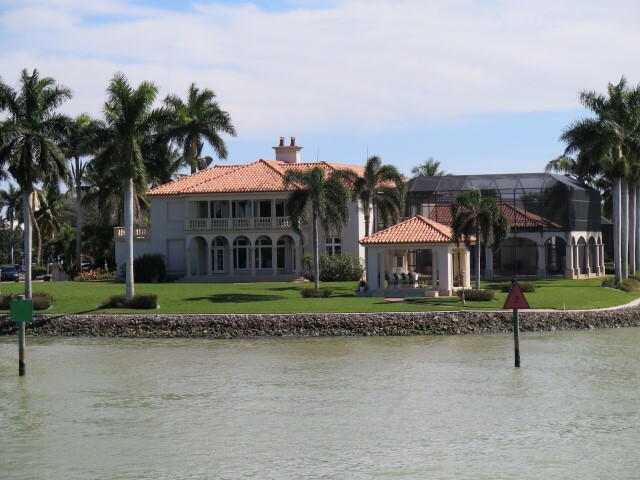 In the Port Royal area, homes go for $20 to $75 million, except that at the lower end of that range they’re basically tear-downs. Really. 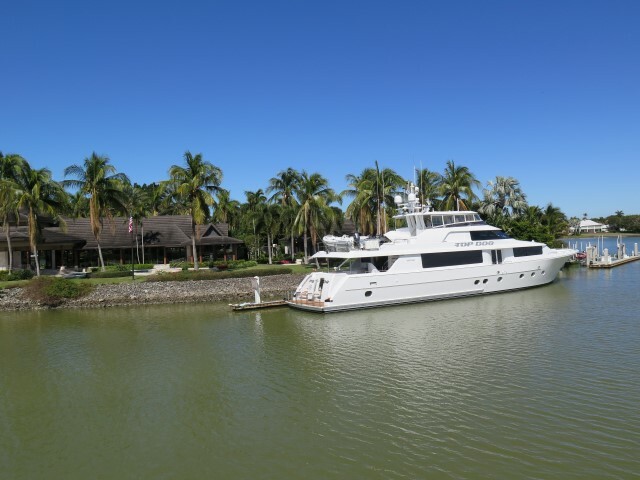 Some bargains can be had across the river, such as at Aqualane, where the homes are in the $10 to $20 million range, although that area is removed from the beach and one has to drive (not that!) to get to a beach. No wonder the homes are so devalued. Location, location, location. And this isn’t just a couple homes … we’re talking about dozens of homes spread across multiple areas. And, even weirder, 80% of the owners in these areas spend less than 4 weeks per year in their homes. So, what of the Hiaasen Complaint? One can certainly wag his finger at the populace here, full of disdain for those who don’t share one’s keen judgment and moral sensibility. I have to be somewhat careful about such moral superiority since I’m basically in the set being wagged at (as I expect Hiaasen is as well). But putting aside all of that, the principal “appeal” of Naples just doesn’t hold much appeal for us. The climate is wonderful, the surrounding natural areas are great, and the people have been uniformly friendly and outgoing. But Naples qua Naples is basically uninteresting and can be easily skipped. 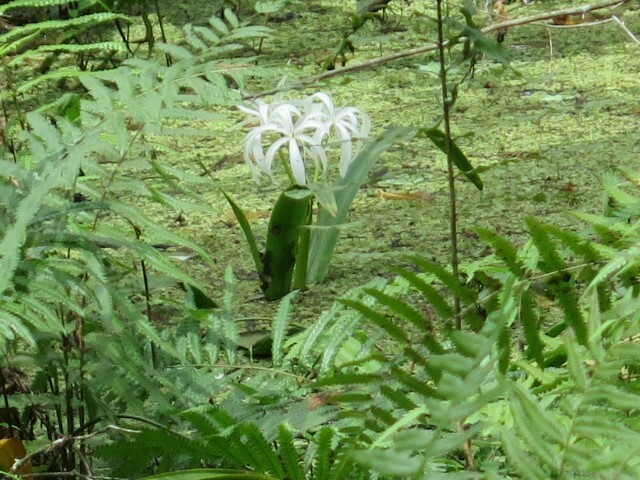 Speaking of the surrounding areas, we did have a chance to visit the Audubon Corkscrew Swamp Sanctuary (due to the recommendation of a friend, the same friend actually). Wow. 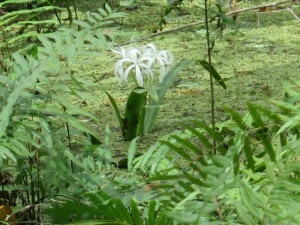 Easily in the same class as the Lower Suwanee NWR, and a wonderful side-trip in the Naples area. Unfortunately, it has been an unusually wet January in this area, so the swamp, which is normally drying out this time of year, is pretty much flooded, which has made the area not as conducive to wildlife and bird viewing as normal. 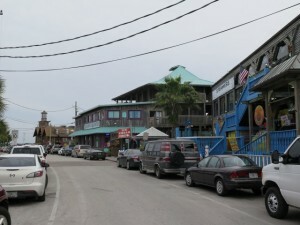 But still, it took us hours to walk along the 2-1/4 mile boardwalk, and we enjoyed every minute of it. We’ll be back. For all of its appeal, though, I cannot avoid commenting that the Audubon Society does manifest a tendency to the very philosophical defect that plagues most environmentalist thinking, namely the elevation of “nature” over people. 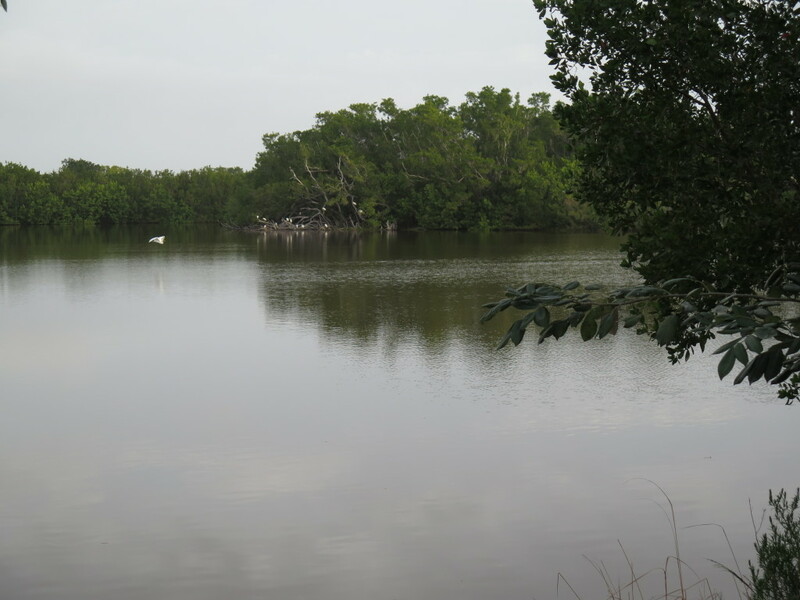 For example, one series of displays shows the increasing number of people and the decreasing number of wading birds in south Florida, exponentially trending in opposing directions. Implied in the display is, “Look! This is terrible! People are going up and birds are going down!” So what? I thought. I wanted to collar some hapless Audubon volunteer with a confrontation, “OK … birds like south Florida and people like south Florida. What’s the right balance? People have to eat, which means we need farmland. We need homes and paper products, both of which mean harvesting trees. How much and where? People enjoy a warm, temperate climate in the winter. What’s your plan to meet that simple aspect of human welfare?” I didn’t. I actually think of the Audubon Society as being on the more reasonable end of the environmentalist spectrum, but I found the content of their message long on doctrine and short on sensible, balanced messaging. Still, it’s a great place to visit. Otherwise, it’s been a relaxing week. 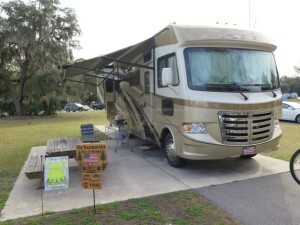 We’ve spent some time here enjoying this wonderful RV resort, which is about the nicest RV resort we’ve ever been to, certainly in the category of the RV resorts in Cashiers and Hilton Head, although our little ACE looks a little out of place. To their credit, no one really seems to mind that we’re definitely the trailer trash of the neighborhood. There was a huge gathering for the Superbowl. There are community breakfasts every morning. One night we got together with a bunch of the residents for a “spirited” (read: “highly competitive”) game of trivia. And one night a local guide came by and gave a fascinating talk on fishing in the Chokoloskee Island/Thousand Islands area of Florida. This resort is probably a little out of our budget for long-term stays, but this is definitely one of the better watering holes around and a great place to camp out while seeking warmer climes. This entry was posted in Deep Thoughts, Travels on February 12, 2016 by skiprd. Our next-door neighbors, here from Kansas and partway through a six-month stint, and who have already booked next year’s six-month stay, raved about the breadth of things to do. They also say that people here are the friendliest they’ve ever met. And this is no low-class trailer park. The rigs here are all high-end, very expensive RVs, with accessory vehicles to match. 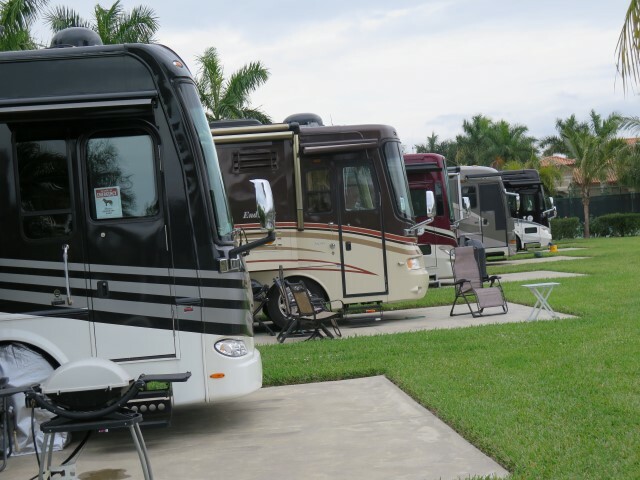 The whole place impresses me as something akin to a seniors’ development, like Sun City or The Villages, but structured around high-end RVs. Still, though, we’re not sure this is our kind of place. 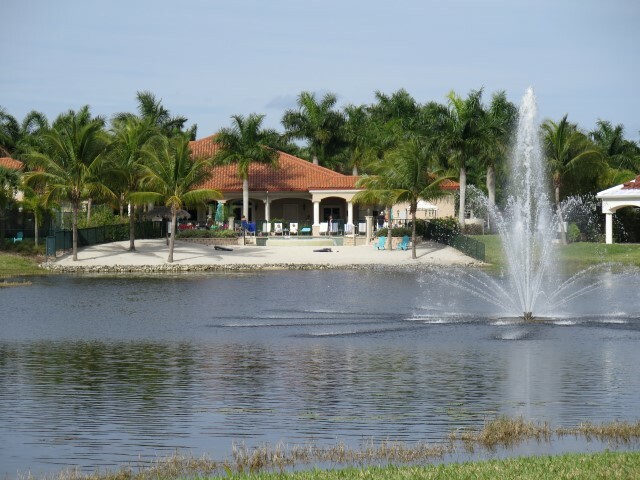 This is our first experience with this kind of environment, and maybe this is what senior living in Florida is all about. So far, we like Cedar Key better. But still … For now, we’re going to reserve judgment and see if this kind of an experience grows on us. 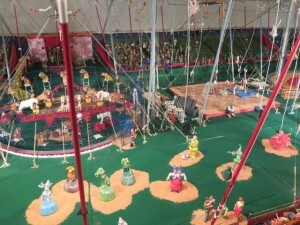 Thursday (Feb 4): I love circuses (circi?). I love the modern variety (like Cirque de Soliel), but I also love the old-fashioned kind, like the old Ringling Brothers & Barnum and Bailey variety I remember as a kid. I think the latter variety is pretty much passe, victims of PETA-induced silliness, OSHA-induced worker safety mandates, and for all I know, EPA-induced elephant poop regulations. Too bad. I guess circuses still exist, but the current “Legends” manifestation of the old circus show just seems to be missing something. 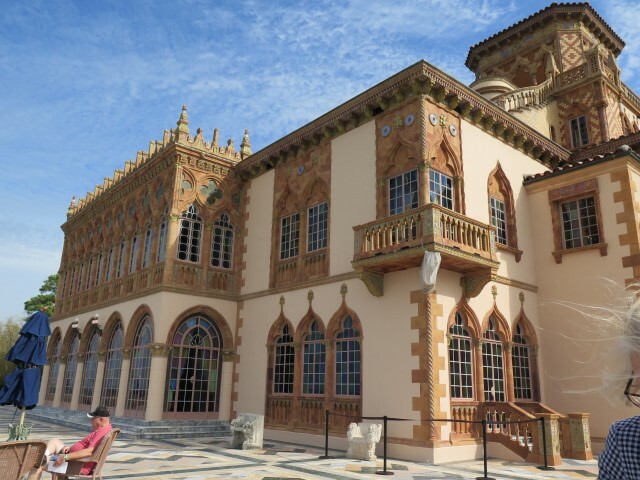 But today we went to The Ringling, where one finds the summer home of John & Mable Ringling, a circus museum, and an art museum, all now operated by Florida State University. 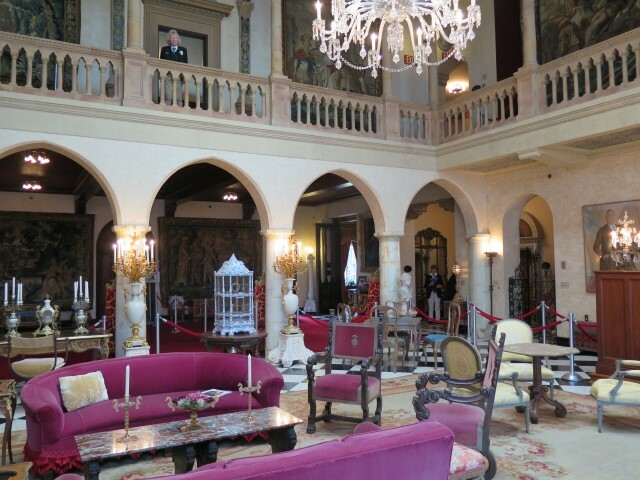 Frankly, I wasn’t expecting much from the Ringling mansion, Ca’d’Zan (which is Venetian for “House of John”). I’ve been to rich people’s mansions before (like the Biltmore), and there’s a limit to how many gold-plated toilet seats I can ogle before the wretched excess of it all makes me, well, wretch. But somehow this place was different. Why was Ca’d’Zan different? Odd as it may seem for a home built by someone who was a successor to P.T. Barnum, it actually seemed less obscene than places like the Biltmore. There’s a way in which the ostentatious display of other mansions is, ironically, vulgar and showy. Ca’d’Zan feels like a place built not to show it to others, but because John and Mable actually liked the stuff they had and enjoyed being around it. I did find some confirmation of the concept (actually both Wendy and I noticed the same thing) in the appearance of the clientele on the tour: none of them wore jeans or T-shirts. They were all nicely dressed as if they were going to someone’s home, not as if they were unemployed ranch hands who got an unexpected chance to gawk at the richies. 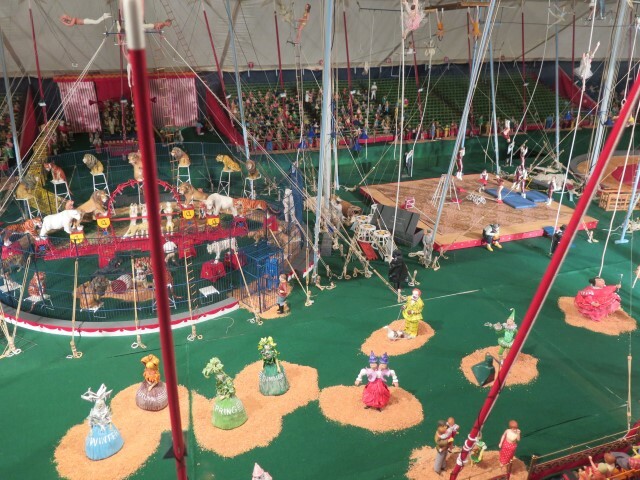 But the highlight was definitely the circus museum. 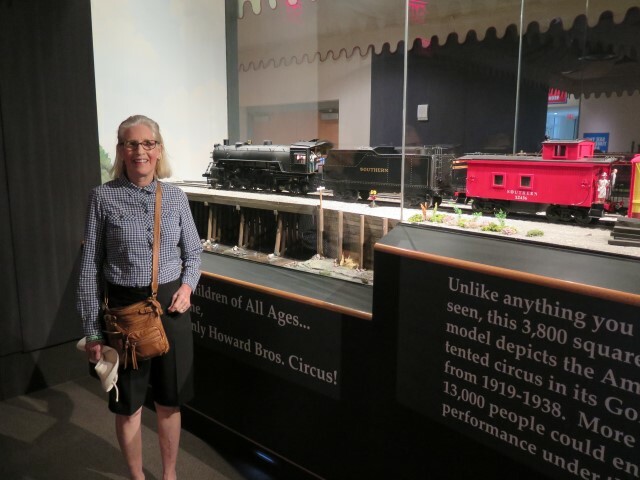 And the highlight of the highlight was the Howard Brothers Circus Model, 44,000 pieces of hand-made animals, people, trains, and tents, showing exactly what happens when the circus comes to town. It took nearly 20 years to first construct the model and it’s been growing and improving for 30 years since then. The process depicted in the model defies belief: over a hundred train cars, hundreds of draught horses to pull the wagons and provide the force to raise the tents, at least five venues including the Big Top that could seat 15,000 people, operations to deal with hundreds of show animals, additional facilities and operations to accommodate the crew and performers. It was in essence a small entertainment city that would show up, be constructed, operate, and then be taken down, all in a day. Amazing. And the model depicts it all, all in 3/4″ scale. Friday (Feb 5): Off to the beach. 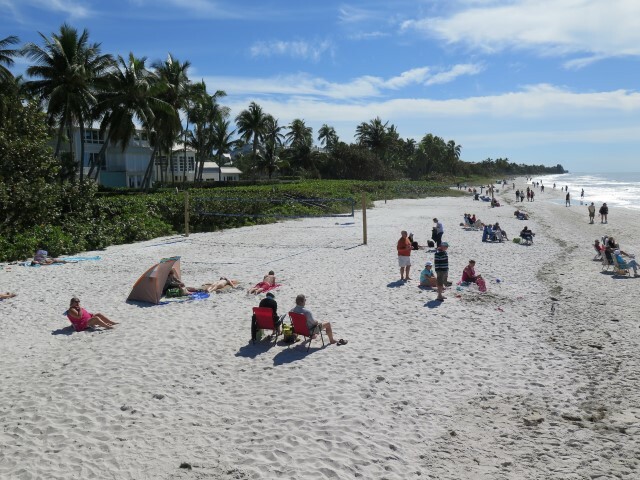 We’d heard that the beaches at the Sarasota/Bradenton area are worth seeing. They are. 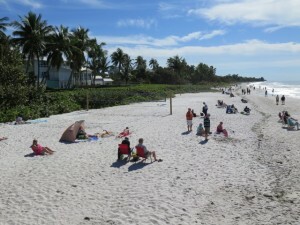 Beautiful white sand, wide beaches, and free from crowds, even at the peak of the February snowbird season. 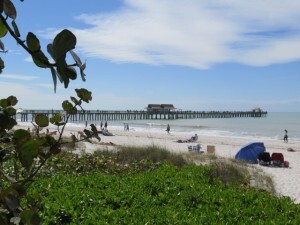 We took the afternoon off and drove over to Longboat Key, north up to Bradenton, and then back. This is definitely a place for quality beach time. Bottom Line: So, after three days here in Sarasota, what’s the verdict? 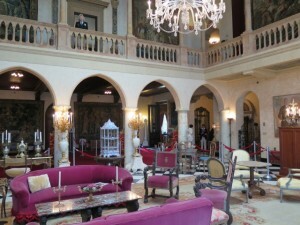 Sarasota is a great place, with lots to do and definitely worth another visit. Would we come back to Sun-n-Fun? That’s a harder question. We both agree we weren’t here long enough to fully explore the option. So, we’re going to check out other places in south Florida and return to that question at the end of the trip. This entry was posted in Travels on February 7, 2016 by skiprd. Ah, the joys of a “learning experience.” The trip from LaGrange was completely uneventful until we decided to make a last-minute deviation from the dictates of the GPS-who-must-be-obeyed. Heading down I-75 to Exit 384 for Florida Highway 24, we saw a sign that announced “Exit 390: Truck Route to FL-26 and FL-24.” Truck route? That’s us. So, off we went. 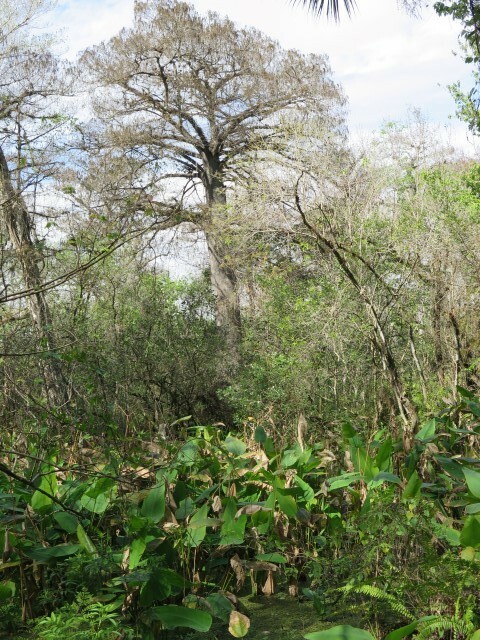 Well, I’m sure there were truck-suitable roads somewhere, but they were never beneath our wheels, especially not as we got routed onto a narrow (like 10-feet wide) horse farm path, crowded on both sides with huge oaks, with air-conditioner-eating branches looming merely inches above us. After we emerged 15 minutes later, Wendy and I tried to figure out the “lesson learned” from that little jaunt, and the best we could come up with is, “If the route looks wrong, STOP!” Seems kinda self-evident in hindsight, doesn’t it? Oh well, other than the terror factor, it was actually a pretty, and memorable, detour. 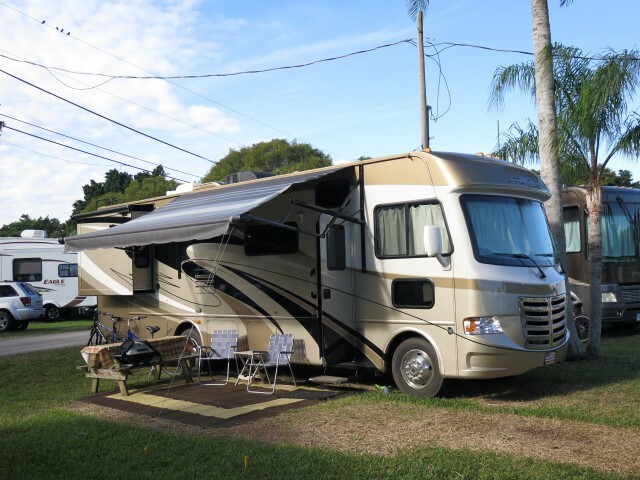 So we set up at Site #3 at Cedar Key RV Resort, relaxed for the afternoon, and readied ourselves for the stay. Sunday (Jan 31): Off to Cedar Key proper, and an insight as to why traveling around, without an agenda or preconceived expectations, is so rewarding. 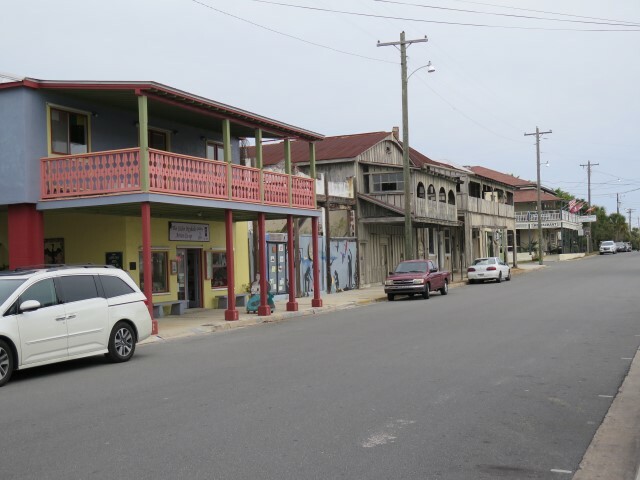 The town of Cedar Key is hard to describe: a rural town that used to be a blue collar fishing village, trying to pull itself up by appealing to the tourist and artiste trades, with some success. In places. Mostly. And then, in the midst our ambivalence, three (count ’em, three!) experiences that made the trip not only worth it, but recommended! First, doing nothing but hang around the boat ramp, we watched a guy launch the strangest looking boat: open transom, with an outboard that dropped down through the center of the hull just aft of the helm. He and his buddy were donning wet suits, and we learned they were going out to “seed” clam beds, which caused us to research the activity. And here’s the story. In the 1990s, the government banned fishing with gill nets, supposedly out of concern for the welfare of dolphins, or turtles, or something, which wiped out the local fishing industry, thereby lowering the welfare of humans. (That trade-off is a topic for another day.) However, in a rare display of compassion for the human toll of such dictates, the government funded the start-up and retraining of fisherman to pursue “bivalve aquaculture” (i.e., clam and oyster farming). There are three phases to such farming. In the hatchery, fertilized eggs and free-swimming larval clams are reared under controlled conditions in large tanks filled with filtered, sterilized seawater, until they are about 1 mm long. Then, it’s off to a nursery, which can be either in tanks or raceways built on land, or in nets out in the bay, where the clams grow to 4 to 6 mm in size. 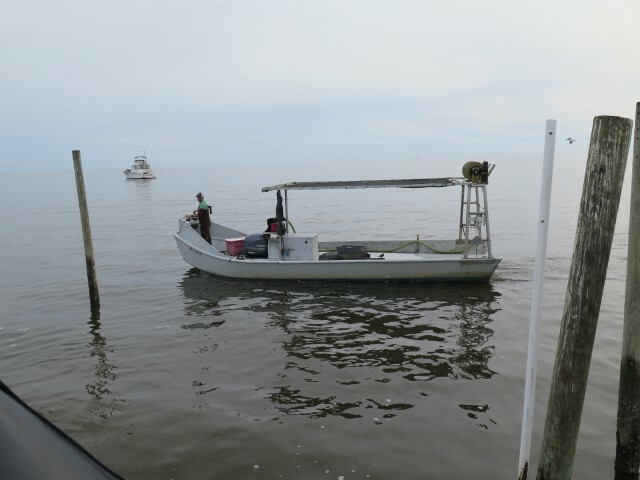 Finally, the clams are placed in nets and taken to “grow-out” areas for 12 to 14 months where they grow to marketable size and are harvested. Each of the former, displaced fisherman was given the opportunity to lease two 2-1/2 acre plots out in the bay for rearing clams. 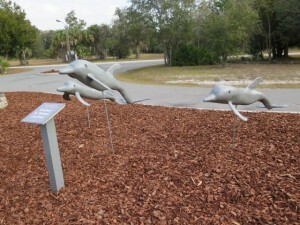 The program has since expanded, allowing the fishermen an additional five acres. An excellent explanation of the process occurs on the Southern Cross Seafoods website. Southern Cross Seafoods also offers tours of their farms, although it looks like we won’t be able to make it. An item for the next trip. Our research indicated that the aquaculture industry is, well, a hard way to make a living. Competition from large commercial operations, predation in the clam beds, the vagaries of weather and sea conditions, and fickle markets, all bear down on those trying to hang on. An article a few years ago from the Gainesville Sun explains the difficulties. Is clam farming a harder life than fishing? Who knows. 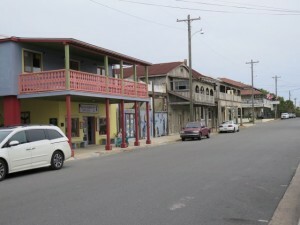 But still, our encounter with this aspect of American life, fascinating in its complexity and implications, would never have occurred but for a side trip to a small town and a chance conversation with a local fisherman in an improbable boat. A clam fisherman off to seed the clam beds. Second, we stopped for lunch at Tony’s Seafood Restaurant for a bowl of clam chowder. Which wouldn’t warrant mention except that it’s the best clam chowder in the world. Really. In 2009, Chef Eric Jungklaus, owner of the restaurant, entered his clam chowder in the clam chowder world competition in Newport, Rhode Island. And he won. At ground zero of the blue-blooded, hoity-toity, clam chowder aristocrats, some guy from a small restaurant in a bitsy Florida town gave ’em all a good old Southern what-for! Then he entered again in 2010, and won again! And then he entered again in 2011, and won again! At this point, faced with wins three years in a row, the organizers “retired” the recipe and politely “excused” Chef Eric from further competition. And the chowder plainly deserves every accolade it gets; it’s not only rich and creamy (which is to be expected since it’s made from half-and-half and whipping cream), it has a spicy kick that lingers on the back of the tongue for a few seconds after every mouthful. It really is the best chowder in the world, and it can be ordered online. See the link above for more information. But the point is, how can this be? 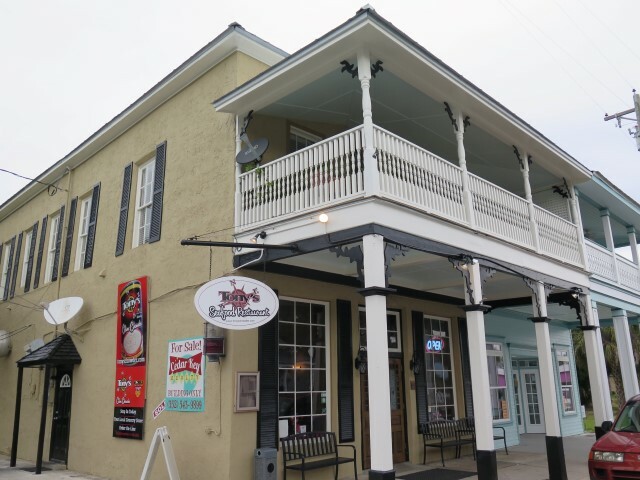 How can the best chowder in the world be found in a small restaurant, in an old building, in a barely hanging on small town? Because that’s the nature of this country, and such is why we travel. Tony’s Seafood Restaurant, home of the best clam chowder in the world. Finally, Wendy and I enjoy learning about nature as we tour around. 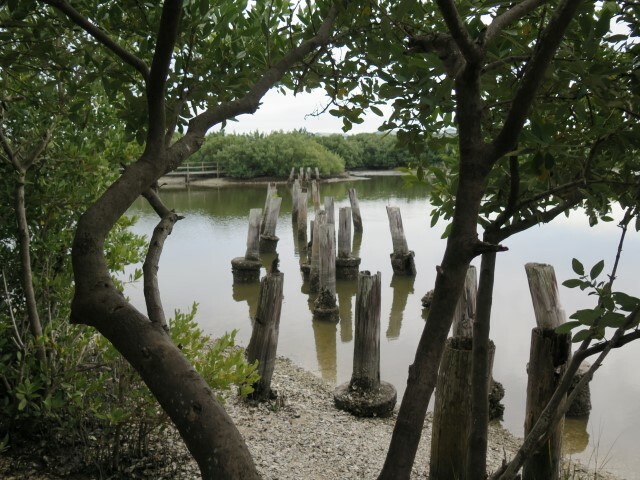 On our way back from Cedar Key, we spied a sign: “Florida Nature Coast Conservancy – Railroad Trestle Nature Trail.” So, off we went. 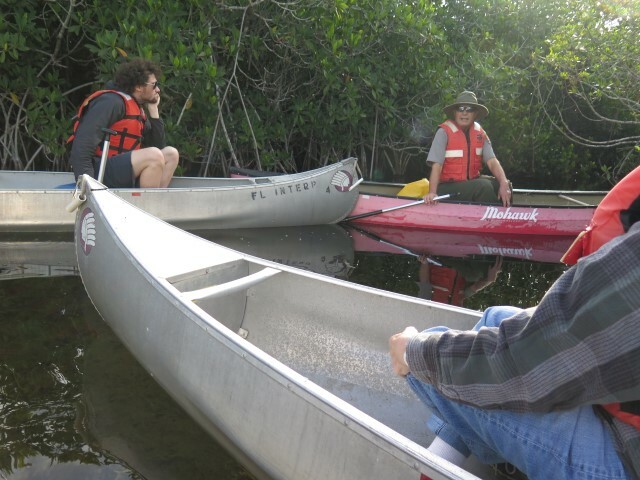 The Florida Nature Coast Conservancy, as it turns out, is a small organization housed in Cedar Key with only five projects to its credit. But sometimes only the locals can focus on preservation opportunities too small for others to notice. Such as an old railroad trestle. A railroad line once ran from Fernandina, across Florida, to Cedar Key. The first train arrived in Cedar Key on March 1, 1861. Daily passenger and freight services from Fernandina Beach continued until the early 1880s when the railroad bypassed Cedar Key for the larger port of Tampa. Service to the island gradually declined until the last train departed from Cedar Key on July 7, 1932. But in the 80+ years since the railroad ceased operations, the course of the railroad line grew back to its natural condition. And now one can stroll along the former lines where the Conservancy has placed dozens of small signs, each carefully explaining what the plant is, where it grows, and what it can be used for. Think of the effort and care that went into that little project. Wonderful. The trestle end of the nature trail. Monday (Feb 1): Many years ago, Wendy and I met a couple who did their RV travels along the lines of one theme for each trip: the best state parks for one circumnavigation, but also less obvious things like minor league baseball parks, presidential libraries or birthplaces, or civil war battlefield monuments. But one of their themes struck a chord: small, local museums. As they explained it to us, they discovered that there are hundreds of top-notch museums, mostly dedicated to local history or specialized themes. 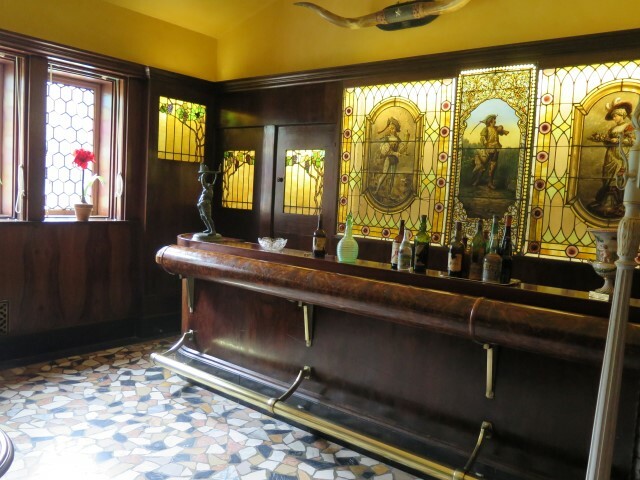 I recall their mentioning the Buffalo Bill Museum in Cody, Wyoming, and the Boy Scout Museum in Dallas, Texas, both of which are on our lists. So, we added to our travel ambitions the idea that we would seek out local museums wherever we happen to be. 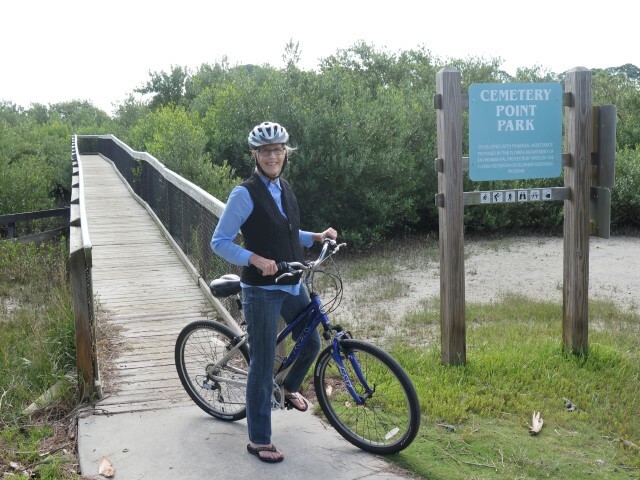 So, this morning we headed off on our bikes and, after a brief stop at the Cedar Key Cemetery and park, made our way to the Cedar Key Museum State Park. En route to the Cedar Key Museum State Park. The museum itself is very nice. Small, but with a full history of the Cedar Key area and a wonderful collection of shells from all over the world. Two things made the museum worth the $2 admission fee. First, the significance of places, like people, often derives from both where they’ve come from and where they’re going. 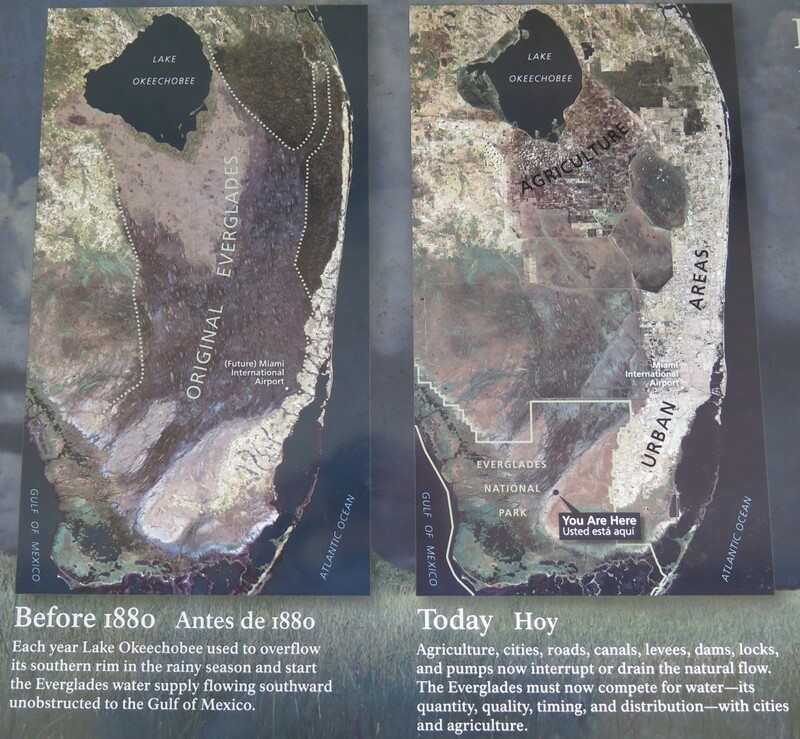 We understood better now the Cedar Key psyche knowing that Cedar Key once operated as one of the principal ports for trade with Mexico, Central, and South America. But second, like the clam farming encounter, travel forces one to realize how much he doesn’t know, how much goes on in the world every day that he just never thought about. An example: pencils. 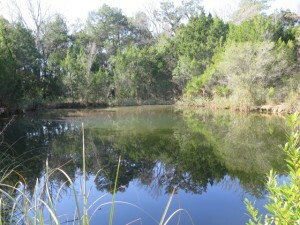 In the 1800s, Cedar Key supported a thriving operation supplying cedar for the A.W. Faber (later Eberhard Faber) pencil factory in New Jersey. And the other part of the pencil, the graphite core, came from graphite mines in, believe it or not, Siberia (! ), where Faber had managed to lock in a lucrative (!) graphite supply contract. The graphite went from the Siberian mine, 300 miles by train, to Irkutsk, and then by ship to New Jersey. All of that for a pencil? So now we found ourselves back to online research, once again captivated by the complexity and, in a sense, the beauty of the networks that operate under our very noses. 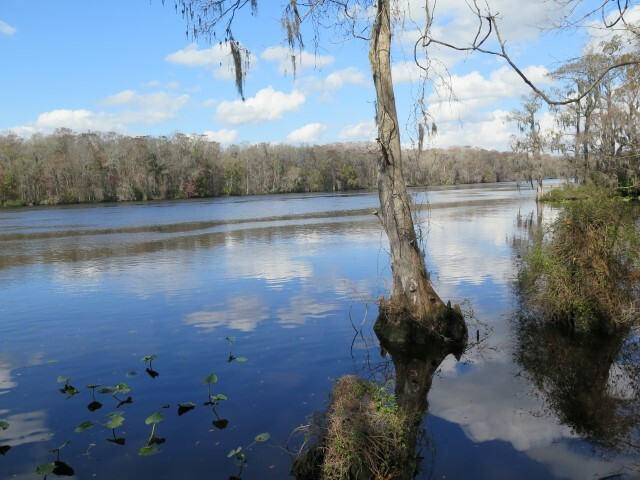 Tuesday (Feb 2): The Lower Suwanee National Wildlife Refuge, 53,000 acres of estuaries, swamps, pine lands, and hardwood, is different than many wildlife preserves in that it’s managed for user friendliness. 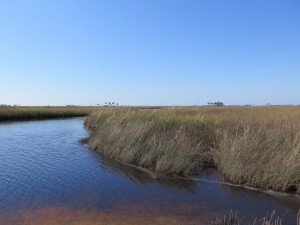 Even to the point of having a nine-mile, meandering road through the NWR that allows visitors to see the full range of habitats present in this area. So, we packed a picnic lunch and headed off, taking our time to explore the area. But first, a digression: the NWR exists without going too far in two of the ways in which I sometimes diverge from my environmentalist friends. First, environmentalists often take humans out of the equation, as if there’s “nature” and there’s “mankind.” One sees it in expressions that human activities are “unnatural.” Environmentalists go too far, probably for the same reason, in supposing that the way to respect nature is to make it inaccessible to humans. Although there were a few areas in the NWR that were off limits, the ranger we spoke to encouraged us to drive the roads, hop the fences, walk the back country. In short, the refuge seems to say, “You are part of this. Come see it, and experience it, and in the process you will learn about yourself.” Second, environmentalists often take the easy road to preservation and conservation: passing restrictions on human activity without having to pay the full costs of what they extract from others. That seems to be less so at the Lower Suwanee NWR: much of the land was purchased, fair and square, by the Nature Conservancy and then donated to the Fish and Wildlife Service for the NWR. On both counts, this is a place that welcomes humans and we were glad to be there. 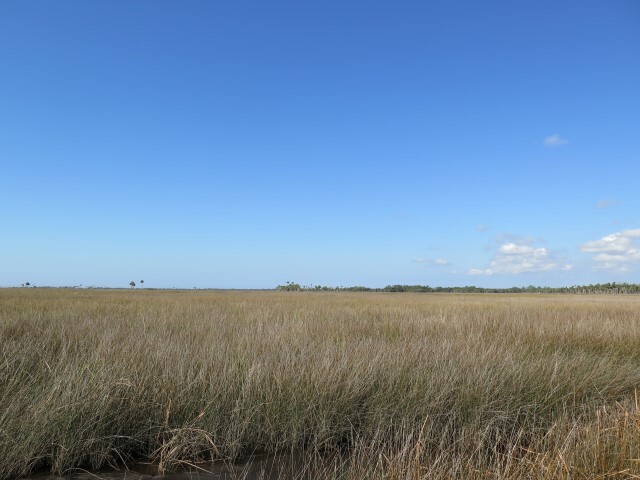 Out to the McCormick Creek estuary, a huge expanse of sawgrass (I think) that seems so out of place that one wonders if it were dropped from outer space. I know that the rap on Florida is that it’s largely populated by despoiling corporate profiteers and land developers, all of whom are the environmental equivalent of serial rapists. That certainly doesn’t seem to be the case in this area of Florida. 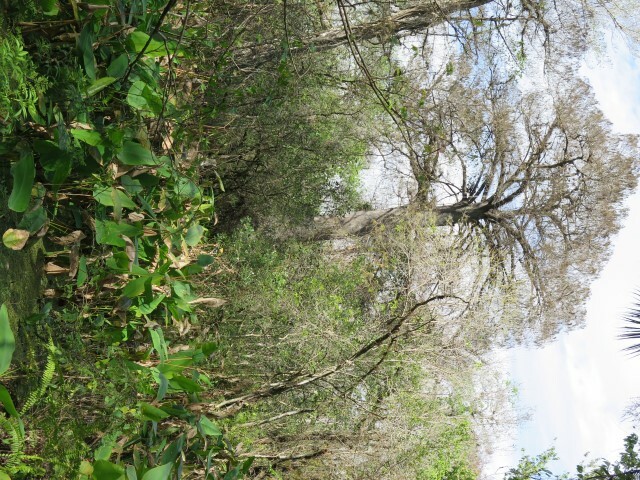 The area is largely unspoiled and manifests a deep concern for the importance of the natural order. It is as worthy a place as any we’ve seen in the Southeast to truly appreciate the beauty of God’s creation. 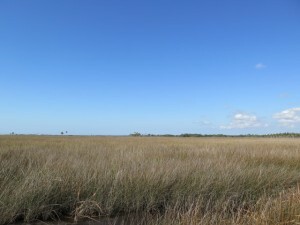 Tomorrow we head off to Sarasota, but knowing that there’s much still we want to do in Cedar Key: kayaking out to the keys, sampling the restaurants, visiting the historical society, touring the clam farming facility, and further exploring the NWR, including the Shell Mound area and the mouth of the Suwanee River. We’ll definitely be back. This entry was posted in Travels on February 2, 2016 by skiprd.